Designed for use in tanks, supports and frames, enclosures, housings, engine, machinery components, and marine applications. 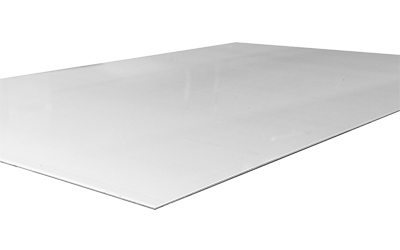 The 316L stainless steel plate is a non-magnetic metal. It is a chromium-nickel product that is used widely because of its resistance to all types of corrosion. This alloy has been formed with high instances of nickel, molybdenum and chromium. Because of the high content of these other metals, 316L stainless steel is tougher and more corrosion resistant. This product has great weldability, machinability, formability and drawability. When needed, it can be deep drawn. Some of the other methods that can be used to form this metal, using cold working, include swaging, bending, cold heading and roll forming. When welding 316L stainless steel plates, any standard fusion method can be used. It can be welded with or without filler metals. Post-weld annealing isn’t required like with 316 stainless steels. Heat treatment cannot be used to harden this metal. However, annealing can be performed, which should be done at a temperature no hotter than 2100 degrees F and no lower than 1900 degrees F. Special consideration should be given to avoid distortion and warping (to compensate for higher coefficient of thermal expansion). Because of its toughness, this product isn’t as easily machined as 304 alloys, but it can be done. When machining 316L steel, tough and strong chip characteristics should be used. It’s also recommended that chip breakers and curlers be used. Low speeds and heavy positive feeds should be applied due to the rapid hardening of this product. After cold forming this metal, make sure to remove the stresses from severely cold formed areas through the process of annealing.